Why Should I Be Worried About Carpenter Ants? Carpenter ants are common pests that show up in NJ homes. These wood-chewing ants are a big problem for homeowners, but not as damaging as termites. If you see these large ants in your home, it’s important to get in touch with your pest control company in Freehold as soon as possible. While sugar ants and other kinds of ants can cause headaches for homeowners by getting into food supplies, carpenter ant infestations can lead to even bigger headaches. These black ants, which can grow up to half an inch long, build tunnels by chewing through wood. Carpenter ants don’t eat wood, but they cause significant damage to homes with their extensive tunnel building. Carpenter ants typically build their main nest outdoors, but they have been known to build smaller nests inside walls and other hollow indoor spots, as well as in decks and porches. Carpenter ant damage can be hard to notice, since it mainly affects areas that are out of plain sight. If you notice these pests inside your home you may have an infestation, so play it safe by having a pest control professional inspect your home. Don’t wait for carpenter ants to cause major damage to your home. If you see them, contact your pest control company in Freehold for help. Call Allison Pest Control, and we’ll exterminate them for you. 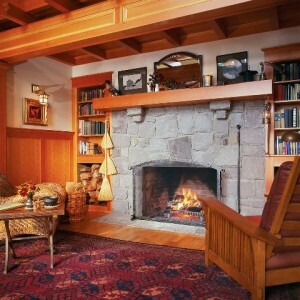 Termites Want to Destroy Your Cozy Home… Don’t Let Them! Termites aren’t the only pests that can cause structural damage to your home. You also have to worry about carpenter ants. The sooner you stop these pests, the better your chances are of preventing major damage to your home. But how do you know if you need Monmouth County carpenter ant control? Here’s how to tell if you have these pests in your home. Carpenter ants differ from the tiny ants you might see in and around your home. Carpenter ants are much bigger. In fact, they’re the biggest ant species in the U.S. They can grow up to half an inch long. Carpenter ants got their name from their habit of chewing up wood in order to create tunnels and nests. While they don’t eat wood like termites, they do chomp their way through wood to excavate and extend their tunnels. This can lead to a considerable amount of structural damage to your NJ home. Watch for little piles of sawdust, which these ants leave behind when they tunnel through wood. Keep in mind that they usually get inside homes through places that have damp wood, such as window frames, door frames, roofs and wall cavities that have water damage. If you’ve seen carpenter ants in your NJ home, contact Allison Pest Control. 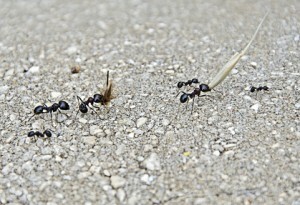 We offer dependable Monmouth County carpenter ant control services. We see them all the time skittering over countertops, walls, and across patios and driveways. 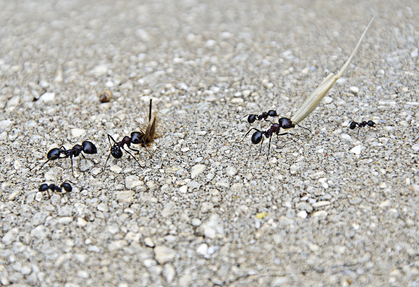 Just about any place there is available food, water, or areas for tunneling or building nests, you’ll find ants. What type of ant you’re seeing is the question. There are brown, black, red and yellow ant species ranging in various sizes. The largest ant in the U.S. is the carpenter ant. These ants are a dull black and can grow to be 3/4 inches long. The carpenter ant is one of the most destructive insects and if you’re seeing signs of them in or around your home or business, you’ll need the professional services of a pest control company. Carpenter ants are aggressive at tunneling their way into wood, so any part of a building such as wood studs, siding, porches, or railings are susceptible to carpenter ant infiltration. The excavating of tunnels into the wood is to create areas where the ants build nests. A colony of carpenter ants can be in the thousands. With so many ants in the colony, the result is significant damage to the home, garage, exterior patios and out buildings. They prefer wood that is soft, such as water-damaged fallen trees, if available, but healthy wood is also on the menu. If you think you have a carpenter ant infestation, contact us at Allison Pest Control for information or to set up an evaluation.